A HEALTHY LIVING steak with Parmesan-peppercorn sauce? Yup. It makes the grade because the smothering is done with onions and fat free sour cream. Pour 1/4 cup dressing over steak in shallow dish; turn to evenly coat steak. Refrigerate 30 min. to marinate. Meanwhile, mix sour cream, 2 Tbsp. of the remaining dressing, Parmesan cheese and pepper. Refrigerate until ready to serve. Heat remaining 2 Tbsp. dressing in large nonstick skillet on medium heat. Add onions; cook 7 to 8 min. or until golden brown, stirring frequently. Remove onions from skillet; set aside. Remove steak from marinade; discard marinade. Add steak to skillet; cook on medium heat 3 to 4 min. on each side or until medium doneness (160ºF). Remove steak from skillet; cut into thin strips. Serve topped with the sour cream sauce and onions. Peppercorn lovers will like the flavor of this creamy sauce when made with 1/2 tsp. pepper. The fat content of beef depends on the cut. 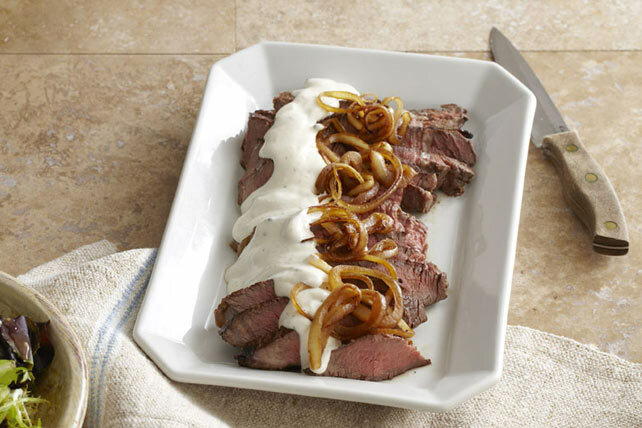 Choose a leaner cut, like sirloin, as a way to enjoy beef in this quick-cooking dish.